Costessey Eastwood Mill or Stone Hills postmill was built c.1810 in Windmill Lane and unusually it had a 16 sided wooden roundhouse. The mill used 4 patent sails to drive 2 pairs of French burr stones. A fantail was on the tailpole. 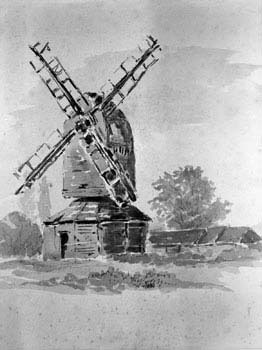 An earlier mill was owned by Robert Fox who later sold the site and mill to local farmer, Edmund Martin, b.1773 in Bawburgh, who built the newer mill shown above. The mill was shown on Bryant's map of 1826. Edmund Martin placed an advertisment in the Norfolk Chronicle on 6th October 1810, asking for a miller to work his mill. As a result of this Robert Leeder was employed as miller and moved into Windmill Cottage on the west side of the mill. Edmund Martin then built another cottage for himself on the east side of the mill, which he confusingly called Windmill Cottage. Both cottages and occupiers are listed on the 1840 Tithe Award. ... 1815 ... 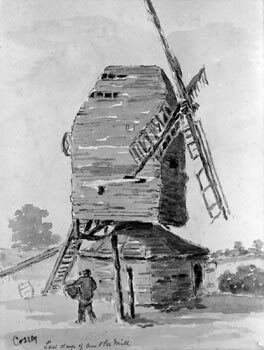 The following year a windmill was built by Edmund Martin, a Costessy farmer shown in White's Directory published a little later. 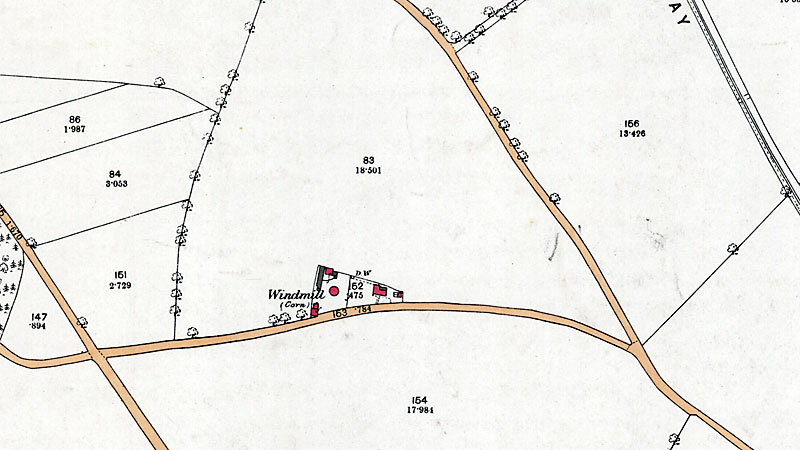 It stood near the lane running from the Croft to the old common and still appropriately called Windmill Lane. But the mill went into disuse during the last decade of the 19th century and was demolished soon afterwards, i.e. about 80 years after it was built. WANTED within one month of date as MILLER to a Windmill, a steady MAN who perfectly understands his business & can have a good character from his last place. Apply personally or by letter post paid to E. Martin, Costessey. No business required on a Sunday. Edmund Martin attempted unsuccessfully to sell the mill on two occasions by advertising in 1846 and 1852. TWO COTTAGES and a POST WINDMILL, at Costessey, in the occupation of Mr. Edward Martin, the proprietor, and his Tenants. For Price and further particulars apply to Mr. Martin, or to Messrs. Mitchell and Clarke, Solicitors, Wymondham, Norfolk. Norfolk Chronicle - 11th & 18th July 1846. In 1851 Edmund Martin was given as a farmer of 330 acres, aged 78, employing 5 men and 2 boys. He was living at Cossey Hall with his wife Martha (32), and daughters Martha (11), Anna (9), and Emily (2). The following advert in the Norfolk Chronicle on 27th November 1852, that offered the mill for sale and removal before 6th January 1853, was also unsuccessful. 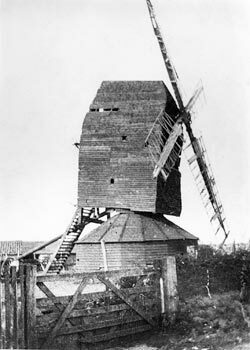 The Windmill may be removed at any time previously to the 6th day of January 1853. For Price apply to Messrs. Mitchell and Clarke, Solicitors, Wymondham, Norfolk. John Gotts was the next miller, who ran the mill under the ownership of Edmund Martin. John Gotts was born c.1832 at Dilham and had previously been at the watermill at Elsing. The mill was for sale in March 1858. A DOUBLE COTTAGE, in the occupation of Mr. John Gotts and Mrs. Critolph, and a Post Windmill, in the occupation of Mr. John Gotts. For Price and further particulars apply to Mr. E. Martin, Costessey; or to Messrs. Mitchell and Clarke, Solicitors, Wymondham, Norfolk. John Gotts then moved to Eglington's mill, Philadelphia Lane, New Catton and James Rumball duly took over. He was born c.1830 in Ormesby, Norfolk. In 1861 he was given as a master miller aged 31 living at Windmill Hill, Costessey with his wife Mary Ann (38); sons John (11), and George (2), and daughter Mary Ann (6). John Rump was miller by 1863. James Rumball later went on to run one of the Philadelphia Lane windmills, probably Bird's and John Gotts was working at the new Costessey watermill. 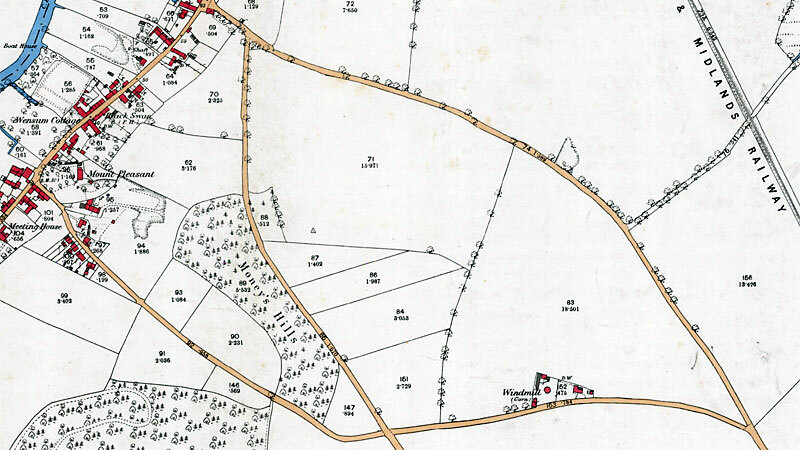 Messrs. Spleman are instucted to sell by Private Contract a Post WINMILL, HOUSE & LAND at Cossey. The mill drives 2 pairs of French Stones. Patent sails, winds herself & the Machinery is in good order. MESSRS. BUTCHER will SELL BY AUCTION, at the Royal Hotel, Norwich, on Wednesday, the 31st of May, 1865, at Five o'clock in the Afternoon, in One Lot. All that WINDMILL, with the Going Gears, Machinery, and Utensils, roundhouse, and other Buildings to the same belonging, and the DWELLING-HOUSE and Garden thereto belonging, containing with the Site of the Buildings 0a. 1r. 4p., now in the occupation or Mr. John Rump, at the low rent of £16 per annum. For further Particulars and Conditions of Sale apply to Mr. E. C. Bailey, Solicitor, Surrey Street; or the Auctioneers, Theatre Street, Norwich. WINDMILL - TO LET from Michaelmas next a WINDMILL, a COTTAGE at Costessey. For rent & particulars apply to H. Coverdale, 27 Bishopsgate Street Within. John Gotts bought all the property before selling it to the Costessey Estate two years later, although he remained at the mill as tenant miller and was listed in White's Directory of 1868 as a corn miller at Costessey. The mill was marked on the 1884 map. John and Richard Gotts then ran the mill from 1868 to 1888. It was unsuccessfully advertised to be let again in October 1889. Around this time John Gotts moved to Costessey_watermill and John Rump returned to the windmill. However, his return was short lived and the mill ceased working within a short space of time before being finally demolished in 1902. In the early 1980s Brian Knight reported that the mill site was in the garden of Windmill Cottage, 29 Windmill Lane and a sycamore tree was growing where the mill had been. Dr. Glyn Brisley mentioned that Mill House had been renamed Wensum View, 35 Windmill Lane. In July 1987, S. Earl of the Norfolk Windmills Trust, noted that a house was being built on the site and the 6 foot deep foundations to the brick piers had been dug out. Having been born and brought up in Norfolk, I do have an affection for historical windmills and windpumps. However, my interest in this particular mill comes from the fact that my parents bought Wensum View (previously Mill House) on Windmill Lane from Dr Brisley (back in 2008 I think).